Taye Drums was founded in 1975 with the sole purpose of crafting instruments that are an extension of your art and originality. Beginning as a company that supplied superior quality hardware and drums to many of the world's most famous brands, after several years it became evident that it was necessary to offer Taye innovations and design ideas to all drummers seeking practical solutions to seemingly complex issues that interfere with the ability to create and perform. Solutions such as the SideLatch Snare Release™, SlideTrack™ Tom Holder System, PocketHinge™ Bracket, Articulated Claw Hook System-that virtually eliminates the need to disassemble claw hooks and tension rods from bass drums when changing heads-and studded lug gaskets that remove any metal-to-wood contact allowing the drum to resonate more freely. Complete attention to detail and playability is incorporated into every Taye drumset, from student level to ultra-professional. What's more, unlike many other instruments, every component is entirely made by Taye. This gives you the assurance of incomparable quality control and serviceability of every instrument and accessory we create. Your only limitation is your imagination - your future lies beyond! 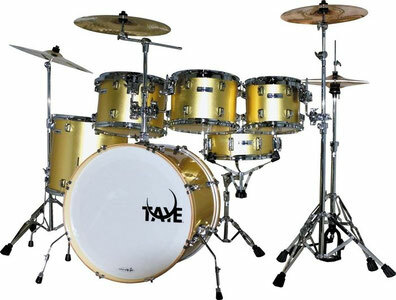 TAYE DRUMS, WHY PAY MORE? tayedrums.nl gaat vertrouwelijk om met uw gegevens. Uiteraard zijn deze bij ons veilig en worden niet doorgegeven aan derden. tayedrums.nl respects your privacy. Your information will not be shared with third parties. 2016 Tayedrums.nl All rights Reserved.